which can be expressed via matrix math as OTX where O is a vector of all the o's e.g. [o0, o1, o2, ... ] which used to be all the m's, except o0 which used to be the b, and X (note it's uppercase) is a matrix of all the values of x e.g. [x0 , x1 , x2 , ...] where x0 is always 1. Note T means Transpose or turn the vector into a 1x# matrix so it can be multiplied by X. So OTX just takes each element of O and mutiplies it times each element of X and adds up the result which is y. In order to find better values for O, we need to understand how wrong our value of y is for ALL the values of X in the training set. A key point is that there may be values of O which work for ONE value of X but not for others. So when we evaluate our current O, we must sum the error for all the given values (or sets of values) of our current guess. To do this, we create a cost function which compares the difference between the desired outcome y and the actual outcome OTX and average that over the number of samples in the training set, m. (m is used by convention to represent the number of samples). The Mean Squared Error (MSE)^ function is commonly used. This is the error squared (OTX - y)2 then the mean of that; the sum of the error squared, divided by the number of samples. We will actually compute half the MSE for reasons which will become clear later (hint: derivative).
} // loop for each sample. return s /(2*m); // divide by the number of samples (mean) times two. but it turns out cost isn't all that important... what we really need to calculate is the slope of the cost! In order to change theta to a better value, we can modify it by a small increment (represented by a or alpha) times the slope of our error. Doing this again and again will slowly move our prediction over the entire training set to an optimal line IF the value of alpha is small enough. If alpha is too large, the new predicted value of theta may overshoot the ideal value and bounce out of control. Of course, very small values of alpha may convirge to the ideal parameters very slowly. Note that we are computing the derivitive of the cost function to find it's slope so that we know which direction to move and by how much. That's why we use half the MSE as our cost function: The derivative of ½x2 is x which is easy to calculate. The slope for parameter OJ is simply (OTX - y) X, or the actual error (difference not MSE) times X. %adjust our parameters by a small distance along that slope. Given an error curve that smoothly approaches a local minimum, the correction applied to each theta is decreased as our error slope decreases, even though alpha is not changed over each run. This helps us quickly converge when the error is large, but slow down and not overshoot our goal as we approach the best fit. This nice curve is not always present. Not all data fits well to a straight line. This is called "underfitting" or we may say that the algorithm as a "high bias". We can try fitting a quadratic or even higher order equation. E.g. instead of O0 + O1x, we might use O0 + O1x + O2x2. But, if we choose an equation of too high an order, then we might "overfit" or have an algorithm with "high variance", which would fit any function and isn't representing the function behind this data. Overfitting can therefore result in predictions for new examples which are not accurate even though it exactly predicts the data in the trianing set. 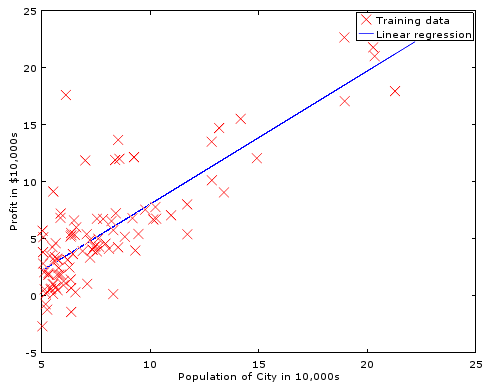 The training data may well have some noise, or outliers, which are not actually representative of the true function. To keep the system from over fitting, and instead provide a more generalized fit, we can add the sum values of O (the theta parameters) to the cost and slope of the error. This makes the system find the smallest values for O that still fit the data. We are saying "even if our training data makes it look like this one parameter (or a few parameters) are really important, don't raise it's theta to much... try to find a fit that uses more of the parameters". We can scale the degree of generalization by multiplying that sum times a value we call "Lambda". Notice we do NOT include o0 aka theta(1) (because Octave indexes from 1) in the calculation, instead replacing it with 0, using the code [0;theta(2:end)] which builds a new matrix with 0 as the first element, and then the 2nd and following elements of the original theta. Remember that theta(1) is bascially the b in y=mx+b; it is the offset of the line vertically. If we penalized the system for having higher values of theta(1), it wouldn't want to find a very nice line that fits the data, when those data points are all high above (or far below) the axis. sigma = std(X); %standard deviation of training set. X = X ./ sigma; % and scale by the deviation. Of course, you must also normalize the new data when making a prediction using the resulting parameters and de-normalize the resulting prediction. But there are better (and more complex) means of adjusting the theta (parameter) values to minumize cost. Stochastic or Mini-Batch Gradient Descent: When working with a very large number of data points, other types of Gradient Descent such as Stochasitc or Mini-Batch can be much faster. fminuc is a common and powerful method. The fminunc function expects a reference to a function which will return cost and (optionally) slope / gradient values for a given set of parameters, training data, and training answers. It starts from an initial set of parameters and there are some options which can be set, such as the maximum number of iterations. %make a guess based on our training data times our current paramaters. err = (hyp .- y); %actual error. %Note this happens to be the derivative of our cost function. This works similarly to fminunc, but is more efficient when we are dealing with large number of parameters. http://joonku.com/project/machine_learning A very nice demo in the browser which is interactive. It readjusts as you click to add data points.